Here’s a great Christmas gift idea for the horse lover in your life: Monty Roberts – the original horse whisperer – has released two children’s books, with proceeds going to horse charities. Monty and the American Competitive Trail Horse Association (ACTHA) have published The Little American Mustang and I’m Shy Boy to benefit mustangs through the Mustang Heritage Foundation. 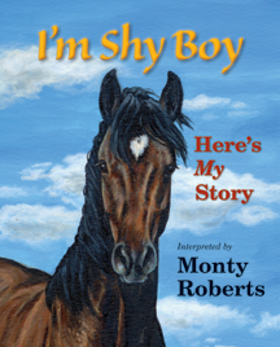 For ages 9 and up: I’m Shy Boy is the story of Monty Roberts’ mustang companion, beginning before he was adopted. His tale begins in the Nevada mountains, where Shy Boy was born into a wild herd of horses. FOR 3 to 8 YEAR OLDS: The Little American Mustang – Based on the true story of Shy Boy, the wild American mustang who learned to trust humans through his adoption by New York Times Best Selling author and world renowned horse trainer, Monty Roberts. This storybook is brimming with vivid illustrations and written from the horse’s point of view much like the original Black Beauty story. Shy Boy’s story will open a child’s mind to what horses and humans can learn from each other when kindness and trust are involved. Little American Mustang shows children how much fun people and horses can have together. For children ages 3 to 8 to explore the adventures through the eyes of a happy horse. The Mustang Heritage Foundation is a public, charitable, nonprofit organization dedicated to facilitating successful adoptions for America’s excess mustangs and burros. Founded in 2001, its mission is to help promote the Bureau of Land Management’s National Wild Horse and Burro Program and increase the number of successful adoptions. Monty will donate $1 from the sale of each book to charity. You can order the books and find out more here.